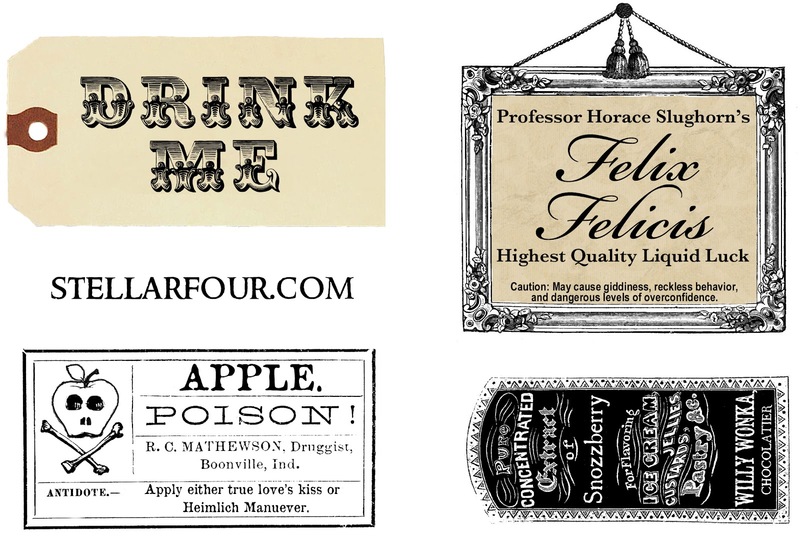 The key to creating the perfect alchemist's laboratory for Halloween is using vintage-looking labels proclaiming fantastical contents on recycled jars. It took me days to make the labels shown in the photo above but, lucky for you, you just have to print them out. In order to recreate the look of my lab, you'll first need to rescue four interestingly shaped bottles from the recycling bin. (I've been saving fun containers for six months for projects like these so I might have had a leg up but I'm sure you'll find a few neat ones in the recycler.) I chose an octagonal strawberry preserves jar from Trader Joe's, a vanilla extract bottle, an airplane bottle of Patron tequila with a cork top, and a Bailey's Irish Cream bottle. Next, print out the labels I've included below. If you want glossy labels, carefully apply two inch wide packing tape on each image before cutting the labels from the sheet. Then, after soaking off the original labels and drying the containers, use double sided tape to adhere the Felix Felicis, Apple Poison, and Snozzberry Extract labels to the bottles. Use a hole punch and embroidery thread to tie on the Drink Me manilla label. One more thing, for the complete look, use a few layers of grey tulle, grey embroidery thread, silver buttons, and glass buttons to decorate the tops of the bottles both for continuity and to obscure any of the original advertising. So, there you go. Download the labels below and get to it! Make sure to check out the downloadable vintage photographs and the crystal spiders and crystal mushrooms how-tos for the complete look. PS: Thanks to the Graphics Fairy for providing three of the base images I used to make these! The Graphics Fairy is an -excellent- resource for copyright free graphics, as well as techniques and ideas for using them. Their articles on image transfers are worth it just for a visit! Fabulous! I love how clever these are! Thank you!